Originally published at Democracy Now on December 4, 2014 featuring Brandon Davidson, nephew of Eric Garner. The Justice Department has announced it will launch a civil rights investigation into the death of Eric Garner after a grand jury decided not to charge a white New York police officer for causing his death by placing him in a chokehold. Garner, who was an African-American father of six, died in July after being placed in a chokehold and wrestled to the ground. The grand jury’s decision set off protests across New York City that shut down parts of the city including the Brooklyn Bridge, the West Side Highway and the Lincoln Tunnel. Protesters also staged a die-in in Grand Central. At least 83 people were arrested. Garner’s death occurred just weeks before Michael Brown was killed by a police officer in Ferguson, and sparked a national debate about police use of excessive force, and the New York Police Department’s policy of cracking down on low-level offenses. Garner was first confronted on July 17 by police for allegedly selling single, untaxed cigarettes known as “loosies” on the streets of Staten Island. Garner’s family says it plans to sue the city for wrongful death, pre-death pain and suffering, and civil rights violations. 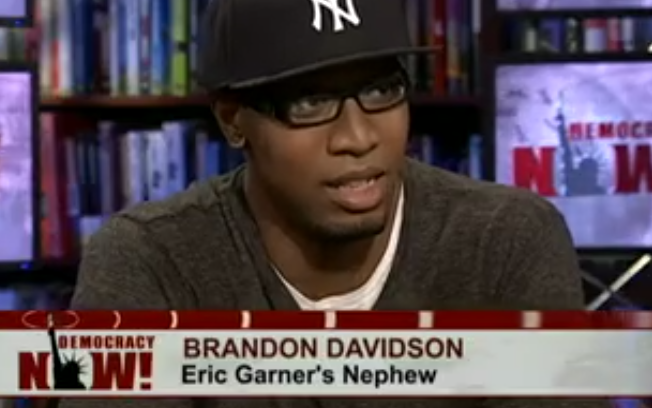 We speak to Garner’s nephew, Brandon Davidson. NERMEEN SHAIKH: The Justice Department has announced it will launch a civil rights investigation into the death of Eric Garner after a grand jury decided not to charge a white New York police officer for causing his death. Garner, who was an African-American father of six, died in July after being placed in a chokehold and wrestled to the ground. The grand jury’s decision set off protests across New York that shut down parts of the city including the Brooklyn Bridge, the West Side Highway and the Lincoln Tunnel. Protesters also staged a die-in in Grand Central. At least 83 people were arrested. Garner was first confronted on July 17th by police for allegedly selling single untaxed cigarettes known as “loosies” on the streets of Staten Island. ERIC GARNER: I’m tired of it! This stops today! It’s over! RAMSEY ORTA: This guy right here is forcibly trying to lock somebody up for breaking up a fight. ERIC GARNER: No, what’s—what are you bothering me for? Everybody says I didn’t do nothing. Everybody standing here, they said I didn’t do nothing! POLICE OFFICER 1: [inaudible] cigarettes [inaudible]. ERIC GARNER: I did not sell nothing. POLICE OFFICER 1: Why [inaudible]? ERIC GARNER: Because every time you see me, you want to harass me, you want to stop me, say I’m selling cigarettes. I’m minding my business, Officer. I’m minding my business. Please just leave me alone. I’ll told you the last time, please just leave me alone. Please don’t touch me. Don’t touch me, please. RAMSEY ORTA: Hold on, hold on, hold me. ERIC GARNER: Don’t touch me, please. [bleep] Do not touch me. WITNESS 1: No! Why are you doing that to him? POLICE OFFICER 1: Put your hand behind your head! ERIC GARNER: I can’t breathe! I can’t breathe! I can’t breathe! I can’t breathe! I can’t breathe! I can’t breathe! I can’t breathe! I can’t breathe! RAMSEY ORTA: Once again, police beating up on people. POLICE OFFICER 2: Back up. Back up and get on those steps. During Wednesday’s demonstrations, protesters repeatedly chanted “I can’t breathe, I can’t breathe.” The cover of today’s New York Daily News features a photo of Garner in the chokehold above the words “We Can’t Breathe.” During a press conference in Harlem Wednesday night, Eric Garner’s mother, Gwen Carr, responded to the grand jury’s decision not to indict the officer responsible for her son’s death. GWEN CARR: I am truly disappointed in the grand jury’s decision this evening. I don’t know what video they were looking at. Evidently it wasn’t the same one that the rest of the world was looking at. How could we put our trust in the justice system when they fail us like this? AMY GOODMAN: Before Garner’s family spoke, Officer Daniel Pantaleo issued an apology. His statement read in part, quote, “It is never my intention to harm anyone and I feel very bad about the death of Mr. Garner. My family and I include him and his family in our prayers and I hope that they will accept my personal condolences for their loss.” Garner’s widow, Esaw Garner, was asked by a reporter if she accepted Officer Pantaleo’s apology. This was her response. ESAW GARNER: No, I don’t accept his apology. No, I could care less about his condolences. No, I could care less. He’s still working. He’s still getting a paycheck. He’s still feeding his kids. And my husband is six feet under, and I’m looking for a way to feed my kids now. AMY GOODMAN: Eric Garner’s family says it plans to sue the city for wrongful death, pre-death pain and suffering, and civil rights violations. For more, we turn to Brandon Davidson, the nephew of Eric Garner. Brandon, welcome to Democracy Now! Again, our condolences on the death of your uncle. AMY GOODMAN: Your response to the grand jury clearing the officer in the chokehold death of your uncle? AMY GOODMAN: At the National Action Network. AMY GOODMAN: Meaning that your uncle had just been a mediator in a fight. He had broken it up. BRANDON DAVIDSON: Yes, he had broken it up. AMY GOODMAN: —in Staten Island on the sidewalk. BRANDON DAVIDSON: Minding his business. Where’s the cigarettes that the police claim that he was selling? Where’s that evidence? But we have evidence that you put my uncle in a chokehold ’til he died, until he died. AMY GOODMAN: Can you tell us a little about your uncle? AMY GOODMAN: Was he your father’s brother? BRANDON DAVIDSON: Yes. Like, the last time I’ve seen Eric before—well, before that incident was my other uncle, Joseph Flagg, who died last year in Jersey, being gunned down by a perpetrator. And, you know, he wasn’t harmful at all. You know, in my eyes, from my experience, he was a good man. I mean, him and my aunt, you know, they’ll have their ups and downs, but at the end of the day, he’s in her life. He’s in his children’s life. Most of all, he’s in his grandchildren’s life, my cousin’s daughters. He’s in their life. NERMEEN SHAIKH: What did you think of—you and your family—of all the protesters who turned out last night against this decision? BRANDON DAVIDSON: Well, it was peaceful. That was a good thing. But it was a great thing to see people come together to rally against the system. But that shouldn’t just happen, you know, during the time of anyone’s death. You know, people should come together, period, instead of just one incident. NERMEEN SHAIKH: What do you think needs to change? BRANDON DAVIDSON: The system, period. Justice. Like, we need justice, period. Because if there’s injustice, then what do we have? AMY GOODMAN: Where were you yesterday when the decision came down? And did it surprise you? BRANDON DAVIDSON: I mean, it didn’t surprise me. I was hurt, but it didn’t surprise me. I was home. It was my day off from work. And that’s what I was waiting for. I was waiting for the news to tell me the cop would not be indicted. It didn’t surprise me at all. It just hurt me. It just stung me. You know, I mourned. And the best thing I did was to keep strong, because I called my cousin, his daughter, Erica. I called her to make sure she was all right. I called my grandmother before she went to the NAN, National [Action] Network. I called my aunt. She was at work, driving to—she was at work, I’m sorry. I just basically called everyone in the family to see if they was all right. AMY GOODMAN: Well, we want to thank you very much, Brandon Davidson, for making the trip here today. Brandon Davidson is the nephew of Eric Garner. It pains me to play in front of you, although I know you’ve seen it I don’t know how many hundreds of times, if you watch TV, that video of your uncle saying, “I can’t breathe” 11 times. This isDemocracy Now! When we come back, Vince Warren will join us. He’s the head of the Center for Constitutional Rights. We’ll also be joined by a retired police detective talking about the culture of police, those who do right and those who don’t. Stay with us.